Excerpt from the novel Buddha’s Wife. Yasodhara was Siddhartha’s wife before he became known as The Buddha. Pajapati was Siddhartha’s step-mother (Yasodhara’s mother-in-law) and the only mother Siddhartha ever knew. His birth mother died shortly after he was born (as did Yasodhara’s mother). First things first and that first was a flicker of an idea given by a friend in Sweden. Next came the research, to find out everything I could about Siddhartha, Yasodhara and their families. That took about 2 years. Then the writing began. Another year moseyed on bye. Editing was the next step, which took approximately 6 months more. Searching for and contacting a publisher that would look at the manuscript took about 2 years, plus another to find one that accepted the story for publication. 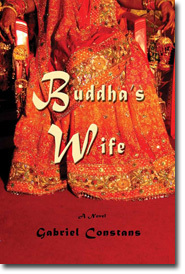 The novel, Buddha’s Wife, is finally published in August of 2009. Before and upon publication, the continuous process of networking and publicizing the book in magazines, newspapers, journals, online, radio, speaking engagements and at bookstores continues. The idea of having the book made into a film comes into fruition about the same time it is published and I start to contact producers to see who might be interested. Getting contact information for well known producers/actors takes a few months. After contacting many about making the book into a film and sending the book to over 20 producers (or their agents) and screenwriters, we (Sacred World Productions and myself) find a few that “might” be interested, but who want to see the screenplay first. Then, the search for a screenwriter begins in earnest about this time last year. 6 months ago, a brilliant screenwriter accepts the challenge on spec, to adapt the book into a contemporary story that takes place in North America. As of today, we are expecting to see the first draft of the screenplay and treatment at any time. Once we have the screenplay, we will be approaching several actors and directors to get them attached to the project. Once we have some well known folks who have agreed to be in the film, we go back to the producers that previously expressed interest, as well as approach some new ones and try to get financing for the film. Getting financing could be another year or two and once it is in place, it will be another 1-2 years before actual filming, editing and production are complete. Then a distributor will have to be found. After those few easy steps are all complete. Whoa-la! The film version of the novel Buddha’s Wife will be available for everyone to see. It will then be nominated in various categories for several award shows, including The Academy and become a box office bonanza. Let’s see… if I add this all up, the total time from original conception to completion is ….. a measly 12 to 13 years! The journey began in isolation and will end up with multiple collaborations and interdependent creative activities. The human and environmental variables that have, can and will effect the process, are countless. This is definitely a process for marathoners and not sprinters. And as far as instant “fame” or “success”… well…. what can I say? Excerpt from novel Buddha’s Wife. Told in the first person by Yasodhara who has left the order and is dying. Ambapali was one of the first women Bhikkhunis (nuns), as was Pajapati (Siddhartha’s step-mother) and Yasodhara (Siddhartha’s wife). Ambapali was in secluded meditation at the vihara of Jetavana. She was bald, having cut off her silky black hair when she joined the Sangha. She wore a simple brown robe, with a single sash to tie at the waist. In her early seventies, her arthritic knees were acting up far more often then she liked to admit. She had to sit on a small stool or recline completely to meditate for long periods of time. Her once sensuous hands; hands that had caressed and brought hundreds of men pleasure in her younger years; were now knotted and swollen like her knees. The skin around her eyes were lined with wrinkles, but her cheeks and lips retained the soft, alluring quality she had had when she first gazed upon her future mentor and lover, Siddhartha. It was in those dark brown pools, of her now enlightened eyes, that The Buddha, Siddhartha of Gotama, had temporarily strayed, allowing his senses to define his consciousness. It was one of Ambapli’s nuns, who brought her one bowl of food per day, who told her of my failing health. Without explanation or hesitation she picked up her shoulder bag and begging bowl and informed the other nuns, who were also on retreat, that she was going south to see me in Rajagaha. Ambapali smiled. “She lives The Way. She is as much a Buddha as you or I.” She bowed to Bishaka, turned and walked away, leaving her devoted devotee staring at her backside pondering how an old woman who had left the order a decade ago could be compared to her beloved, enlightened Ambapali. As Ambapali left the protected encampment a torrent of emotions, thoughts and images assaulted her memory. With relentless ferocity they took her into the past, provoking anxiety and doubt about seeing her friend, the woman whose husband she had laid with, consuming his body and his mind. We had embraced as sisters. Her expression of sympathy and attempt to take down the fence that had been erected between us while we lived together as nuns, were heartfelt. We had finally acknowledged that the fence existed and agreed to open the gate to forgiveness. She knew that she and Siddhartha had been seen together several times. When she first joined the order she had taken every opportunity to seduce him, to find out what he was made off. For some time she had been successful. Even though they were painfully discreet she had felt the eyes of others in the night; the eyes of those who would not and could not understand her need to discover if this was The Buddha, The Enlightened One or simply a man with human needs like all the rest. She stumbled on a root and stopped from falling by grabbing onto a knotted branch that looked like her hands. As she found her balance and told her self to pay more attention to what was in front of her, an image of her mother, who had also been a courtesan, came upon her. Her mother was thirty and she was fifteen when she realized what her mother did to survive. She had promised that she would never follow in her footsteps. Her mother promised to find her a respectable husband to marry. How she could fulfill that promise was a mystery, but one her mother had tenaciously held to her death. They had been walking along a path, like the one she was on now, when her mother stopped dead in her tracks and fell to the ground convulsing, phlegm oozing from the corner of her mouth. She remembered screaming, “Mother . . . mother!” Her mother’s eyes had rolled back in her head as her jaw clamped shut. Her breath came in spurts. She shook her again and again crying, “Please . . . somebody!” but no one could hear her cries. It was soon over. It had been quick; without warning. She’d lept from her mother’s side and ran. She ran and ran, as fast as she could. She ran to her uncle Sikhura’s house and told him what had happened. In spite of his wife’s lamentations to not get involved with “that woman”, he followed Ambapali back to his sister’s body and brought her home for cremation and religious services. After the funeral Sikhura offered to take in Ambapali, but his wife would have no part in it. “I won’t let a woman like that in my house!” she insisted. “She’s old enough to know what to do with you,” she’d said venomously. Ambapali overheard their conversation. She was ashamed and left in the middle of the night. Not knowing where else to turn, she found her way back to her previous residence, the House of Yoniatma. After several lonesome months of mourning she was “put to use” and “taught a trade”. She began her training in the art of Kama Sutra, the art of “making” love and was taught how to minister too and please men. She had been very successful at her vocation. It had given her access to many powerful and wealthy men, but had never brought her happiness or peace. She soon realized why her mother had wanted her to take a different path. It wasn’t until she had encountered Siddhartha in her mango grove that she had ever entertained the thought that there was something more, something beyond the known, the physical. His words had sparked a smoldering fire that lit her curiosity. She became determined to see if his words were real or more false promises. She vowed to find the truth, even if it cost her some clients or ironically, sullied her reputation. Five years after following The Buddha’s teachings and meditation practices from the time she opened her eyes in the morning until she fell asleep in the night, Ambapali discovered that she knew so little and wanted to experiencing everything. She left her courtesan life, took her vows to follow the precepts and lived as a nun. There had been a particularly long winter when the brothers and sisters of the Sangha (believers of the Buddha’s teachings) had been in retreat throughout the rainy season. Ambapali had finished eating her only meal of the day and was mindfully washing out her bowl, contemplating its emptiness, when she awakened to something beyond her self, something that was greater than her ego or self-consciousness. It was indescribable, yet she had tried. Thirty-eight years later the glow remained. She had become so unselfconscious that she was often not aware of herself as a separate entity. As long as she was in her physical body, thoughts, emotions and sensations would continue, but her compassionate nature was so ingrained that people wanted to be around her, to touch her, to bask in her presence. Now, if her knees would allow it and the rest of her aging body permit, she would see me once again. The woman who had shared her intimacies, fears and joys; the one she had unintentionally hurt beyond comprehension. Excerpt from the novel Buddha’s Wife. Historically, Rahula was Yasodhara and Siddhartha’s son. Siddhartha was later known as “The Buddha” or “The Tathagata”. She hitched up her sari and ran alongside her husband and son. The sound was like thunder. Their feet slid and bounced on the ground as it heaved. They plastered themselves against the shallow crevice just as the stampeding elephants ran by, their eyes wild with fright. They had avoided bandits by following Rampal and Moksa’s advice. They had traveled in numbers and kept to the center of the plains. Now, just as they were about to traverse their last major obstacle, the Aravalli Mountains, some idiot had tried to catch a baby elephant. His attempt had angered the herd. People scattered to safety, but Rahula and his family had found themselves caught in the gigantic mammals’ path with nowhere to turn. As the last tusked male lumbered by, blowing his trunk, Bodhi coughed violently from the wave of dust. It was so thick they could barely see one another. “Bodhi.” Savarna covered his mouth and eyes with her sleeve, hoping that would alleviate the irritation. His coughing continued and they tried to comfort him, to no avail. His cough had worsened over the last several days and this was not helping. It was deepening and dangerously persistent. “What happened?” Rahula exclaimed, after the last elephant had passed. “I wasn’t sure,” Rahula panted, gasping for air. They all rubbed their eyes, blinking to wash away the dust and dirt. Carrying his coughing son on his back, Rahula and Savarna backtracked and asked everyone they met if they knew of a healer in the vicinity. Late in the afternoon they came upon a woman washing clothes at the river. Her children were close by. They expected her to reply like all the others, that there was no help in the area. Rahula and Savarna shared a hopeful glance. “Here,” Savarna said, “let me help.” She got down on her hands and knees, took a wet sari out of the basket and pushed, twisted and shook it in the wind, then folded it neatly and placed it on top of the other clean clothes in the adjoining basket. The women smiled and quickly completed their task. “I am Henna,” the woman said, as she picked up her basket and called to her children. “Come. I will take you to my mother.” She looked at Bodhi, who was clinging to his father’s back and coughing. “She can cure anything.” They followed Henna towards the small village. “The Bodhi tree is the same one under which our Lord Buddha of Gotama awoke to his true nature,” Henna said. “Are you followers of the Tathagata?” Henna inquired, as she lifted the basket onto her head. They walked the rest of the way in silence. Rahula wanted to find a remedy for Bodhi’s cough but hated the fact that it might come from a disciple of his father.